There is a prominent connection between vitamin D and blood pressure. But don’t worry, vitamin D doesn’t raise blood pressure—on the contrary, it can help lower it, and people with high blood pressure, or hypertension, may want to consider taking a natural and active supplement in the form of vitamin D3, also called cholecalciferol. People with high vitamin D levels often have lower blood pressure, and are also less likely to develop high blood pressure. Hypertension is a chronic and very common condition. In fact, it’s thought to affect one in three people in the U.S., including 65% of those 65 years old and older. The clinical classification of hypertension is a systolic pressure of 140 mm Hg and over, and a diastolic pressure of 90 mm Hg and above. Normal blood pressure is a systolic pressure between 120 and 129 mm Hg, and a diastolic reading between 80 and 85 mm Hg. What does the scientific evidence tell us about the link between vitamin D and lower blood pressure? Some research suggests that taking vitamin D3 supplementation can help reduce lower blood pressure. For instance, a randomized, placebo-controlled study published in the American Journal of Hypertension in 2012 found that vitamin D3 supplementation significantly decreased systolic and diastolic blood pressure. Researchers examined the effect of 3,000 IUs (international units) of vitamin D3 per day in 130 patients with hypertension. Other studies suggest that vitamin D, including the active or inactive form (ergocalciferol), are both ineffective for lowering blood pressure. However, some of these studies were shorter and used smaller doses of vitamin D. These negative studies were also not published in recognized scientific journals. Adequate levels of vitamin D in the blood are considered very important. If you are vitamin D deficient, you may experience depression, bone pain, fatigue or tiredness, and pain and weakness in the joints and muscles. Vitamin D deficiency is also linked with osteoarthritis, autoimmune disorders, multiple sclerosis, diabetes, and cancer. It’s also important to note that low levels of vitamin D are common in African Americans, and in people with obesity, chronic kidney disease, and digestive disorders like Crohn’s disease or celiac disease, as well as those over the age of 65. Vitamin D deficiency is also a sign of cardiovascular conditions such as high blood pressure. Research also shows a connection between low vitamin D levels and an increased hypertension risk. In a study published in the peer-reviewed journal The Lancet: Diabetes & Endocrinology in 2014, researchers found a genetic association between low vitamin D and high blood pressure. This meta-analysis included 35 studies and 108,173 participants of European ancestry that currently live in North America and Europe. Another study published in the journal JAMA Internal Medicine in 2009 found that over 75% of the participants examined had low levels of vitamin D in the blood. Overall, many estimate that 40% to 75% of Americans are vitamin D deficient, so it’s a good idea to check your vitamin D levels annually, especially if you have high blood pressure. Other risks of unmanaged blood pressure include stroke, congestive heart failure, and heart attack. What is the specific role that vitamin D plays in decreasing high blood pressure? There are strong connections between where a person lives, vitamin D levels, and high blood pressure. Basically, the further you go from the equator, the higher the blood pressure. This suggests that vitamin D may protect against high blood pressure. There are other factors which may explain why vitamin D lowers blood pressure. For example, some studies that suggest that there’s a link between vitamin D and blood pressure regulation through the renin-angiotensin system. This system influences how vitamin D affects the kidneys and renal glands through a hormone produced by the kidneys called renin. Also, parathyroid hormone (PTH) levels will increase when vitamin D is low, and high PTH can raise blood pressure by increasing the effect on renin secretion. It’s thought that low vitamin D is associated with reduced sensitivity to insulin, which can raise blood pressure. The lack of vitamin D may cause blood vessel walls to thicken and stiffen, resulting in high blood pressure. It’s also possible that vitamin D isn’t associated with blood pressure at all. Instead, low vitamin D levels may be linked with other high blood pressure risk factors, including consuming an unhealthy diet, lack of exercise, and obesity. How Much Vitamin D is Safe to Consume? According to the Institute of Medicine at the National Academy of Sciences, the appropriate daily intake of vitamin D for infants, children, teenagers, adults, and pregnant and lactating women between the ages of 19 and 50 is 200 IU, or five micrograms. Older adults between 51 and 70 should take 400 IU daily, while those aged 70 and above should take 600 IU each day. Other research suggests that people should be taking 2,000 IUs of vitamin D every day, especially if they are deficient. There are even studies which say that 10,000 IUs of daily vitamin D is not considered toxic. The human body does not make vitamin D. This means it must be obtained from the environment, especially from sunlight. In the summer, it’s a good idea to spend 15 to 20 minutes a day outside exposing your hands and face to the sun; or enough time that your skin turns pink or slightly dark. The ideal time is between 11:00 a.m. and 3:00 p.m., at least two to three times each week. Try taking a short walk during lunch. Vitamin D can also be obtained through diet, but it’s not easy. Several foods are fortified with the inactive vitamin D2, including cereals and milk products. Good dietary sources of vitamin D3 include eggs and fatty fish and seafood such as salmon, mackerel, trout, sardines, tuna, cod, herring, catfish, halibut, oysters, and shrimp. You can also supplement with vitamin D emulsion or liquid drops. Each drop will give you 1,000 IU of vitamin D3. 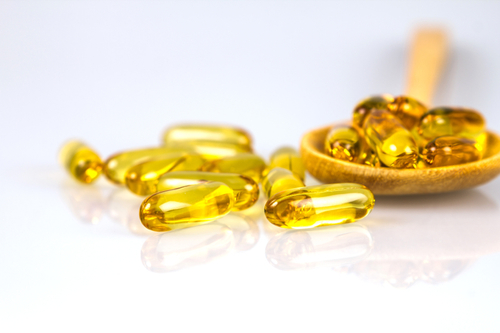 Fish oil, seal oil, and cod liver oil are other good sources of vitamin D3. Homeopathic remedies: Homeopathy is a perfect complement for those trying to lower blood pressure. Remedies often recommended as part of a hypertension treatment plan include aurum, argentum nitricum, belladonna, glonoinum, lachesis, natrum muriaticum, nux vomica, crataegus, strontium carbonicum, veratrum viride, and viscum album. Aged garlic extract: Aged garlic extract has been found to have similar effectiveness to the standard blood pressure drugs for hypertension, according to a study published in the journal Integrated Blood Pressure Control in January. The active ingredient in garlic, allicin, is responsible for lowering high blood pressure by relaxing blood vessels. Taurine: Human and animal studies have found that the amino acid taurine can regulate blood pressure, and act like an anti-inflammatory agent and antioxidant. As a result, taurine can also help protect against coronary heart disease. It’s recommended to take up to six grams of taurine between meals to help reduce hypertension. Regular exercise: If you are overweight or obese, it’s very important to lose weight. Regular exercise of 30 minutes a day is thought to lower blood pressure by four to nine mm Hg. Types of exercise include walking, swimming, cycling, jogging, and weightlifting. Equally important is maintaining a healthy, nutrient-dense diet including whole foods that is high in vegetables, fruits, nuts, seeds, and non-gluten grains. Other natural remedies and therapies: Other natural ways to reduce high blood pressure include basil, cinnamon, cardamom, flaxseed, ginger, hawthorn, celery seed, French lavender, cat’s claw, vitamin B6, folate, reishi mushroom, dandelion leaf, oatstraw, chamomile, valerian, passionflower, hibiscus tea, potassium, black cohosh, magnesium and calcium combinations, omega-3 fatty acids, vitamin C, coenzyme Q10, and beet juice. Other therapies that reduce hypertension include massage therapy, acupuncture, osteopathic and craniosacral therapy, reflexology, hydrotherapy, aromatherapy, and deep breathing exercises. Vitamin D is considered completely safe in recommended amounts, and most people do not experience any side effects. However, taking excessive doses of vitamin D may result in dry mouth, a metallic taste in the mouth, loss of appetite, headaches, sleepiness, weakness, fatigue, vomiting, or nausea. There are also interactions between vitamin D and blood pressure medications such as diltiazem and thiazide diuretics, as well as other drugs including calcipotriene, digoxin, verapamil, seizure drugs like Dilantin and phenobarbital, steroids like prednisone, and aluminum found in most antacids. Larsen, T., et al. “Effect of Cholecalciferol Supplementation During Winter Months in Patients with Hypertension: a Randomized, Placebo-Controlled Trial,” American Journal of Hypertension, 2012; doi:10.1038/ajh.2012.111. Ginde, A.A., et al., “Demographic Differences and Trends of Vitamin D Insufficiency in the US Population, 1988-2004,” JAMA Internal Medicine, 2009; doi:10.1001/archinternmed.2008.604. Judd, S.E., et al., “1,25-dihydroyvitamin D3 reduces systolic blood pressure in hypertensive adults: a pilot feasibility study,” The Journal of Steroid Biochemistry and Molecular Biology, 2010; doi:10.1016/j.jsbmb.2010.04.013. Reid, K., et al., “The effect of aged garlic extract on blood pressure and other cardiovascular risk factors in uncontrolled hypertensives: the AGE at Heart trial,” Integrated Blood Pressure Control, 2016; doi:10.2147/IBPC.S93335. Oktawia, P.W., et al., “The potential protective effects of taurine on coronary heart disease,” Atherosclerosis, 2010; doi:10.1016/j.atherosclerosis.2009.06.002. Vimaleswaran, K.S., et al., “Association of vitamin D status with arterial blood pressure and hypertension risk: a mendelian randomization study,” The Lancet: Diabetes & Endocrinology, 2014; doi:10.1016/S2213-8587(14)70113-5. “Vitamin D,” Web MD web site; http://www.webmd.com/vitamins-supplements/ingredientmono-929-vitamin%20d.aspx?activeingredientid=929, last accessed March 10, 2016. “Vitamin D,” Weil web site; http://www.drweil.com/drw/u/ART02812/vitamin-d, last accessed March 10, 2016. “The Truth about Vitamin D: Can You Get Too Much Vitamin D?” Web MD web site; http://www.webmd.com/osteoporosis/features/the-truth-about-vitamin-d-can-you-get-too-much-vitamin-d, last accessed March 10, 2016. Rubin, A.L., “Looking at Vitamin D’s Role in Blood Pressure,” For Dummies web site; http://www.dummies.com/how-to/content/looking-at-vitamin-ds-role-in-blood-pressure.html, last accessed March 10, 2016. Krucik, G., “Effects of Vitamin D Deficiency,” Healthline website, August 5, 2014; http://www.healthline.com/health/vitamin-d-deficiency, last accessed March 10, 2016.